Do you know if any of the health programs like crossfit actively teach their converts to hate fat people? I ask because I was shocked this week when a friend of mine who has become a serious workout-holic compared fat people (in general) to [drug users]. I’ve known him for 20 years and he’s never before displayed this kind of bias. The fitness industry and the diet industry are deeply intertwined, such that we are encouraged to believe that the only “correct” outcome of a fitness program is a body that looks a certain way (thin, muscular, swimmer’s build, etc.) Because that is seen as the goal, bodies that don’t fit the mold are seen as bad, or wrong, or failures at fitness, and those of us with fat bodies are often used as “cautionary tales” by those in the fitness world. I have more than once told someone leading a fitness class that I am not motivated by their suggestion that everyone in the class should be working hard to not look like me. The truth is that self-loathing sells and many fitness programs take advantage of that. Now, people are allowed to try to manipulate the way that their bodies look, and they are allowed to hate their bodies (Underpants Rule!) The problem happens when they transfer their self-loathing of their fat body onto other people’s bodies. Sometimes it’s just about the development of an appearance-based prejudice. Sometimes people aren’t able to comprehend that their experience is not everyone’s experience and so they are unhappy with their experience/behaviors/current state for some reason and they assume that 1. All fat people have the same experience/behaviors/current state as they do and 2. All fat people should be made to feel the misery that they feel. It can also be about the reinforcement of anti-fat sentiment by instructors who feel comfortable making generalizations about fat people and then using us as motivation for those in their charge. This can spin out of control pretty quickly. Some of the most horrible hate mail that I get is from online forums that are supposed to be about fitness but that dedicate threads, and sometimes entire days, on their forum to what they call “fat hate”. This includes ridiculing fat people on their forum, and also sometimes encouraging people to send e-mails to fat people for the express purpose of bullying/being cruel. Some of the worst of the worst bullying I’ve received from these sites have been because I chose to engage in fitness activities. I think that this is often about the lack of maturity, on the part of those perpetuating the hate, to understand that people can make different choices than us about own bodies and health, and that doesn’t threaten or invalidate their choices. In other cases it can be about people who are benefiting from a world in which their body size is seen as more valuable and so those of us who come along and insist that all bodies are equally valuable are a threat to them. Regardless of why it happens, it’s not ok. For me it’s important to remind myself that the problem isn’t me, it’s them. Nobody is obligated to participate in exercise or fitness of any kind, and participating doesn’t make anybody better than anybody else. Those who want to participate should be able to do so without fear of shaming or bullying. This is one of the reasons that Jeanette DePatie and I co-founded the Fit Fatties Forum, and Facebook Group so that people who want to talk about fitness from a weight neutral, body positive perspective have a place to do that. Given our current culture and all the messaging from the diet industry, unfortunately it’s all too easy for fitness to become fat hate, and it does a disservice to all of us. For those of us who are interested in participating in movement/fitness, there are lots of ways to do activism around this – we can show up with our big fat bodies and participate. We can be encouraging to others who want to participate regardless of size. And speak out when we see people trying to turn the movement we love into the prejudice that we abhor. LAST DAY TO JOIN! 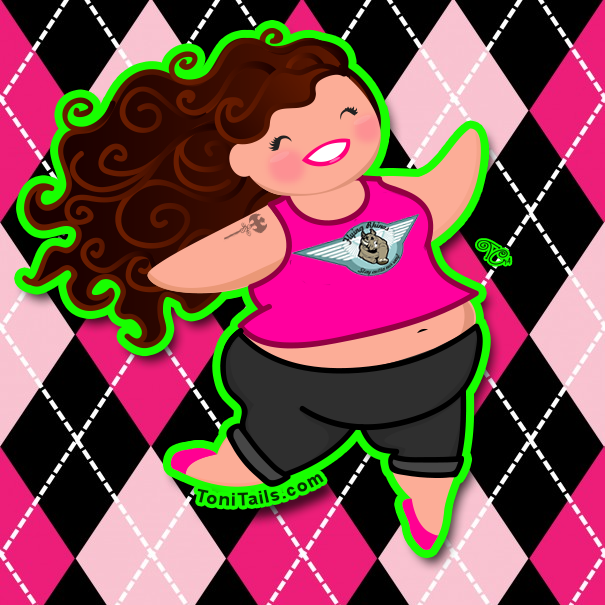 If you’re looking for fun fitness motivation for the New Year without any diet talk, weight loss talk, or body shaming, but with lots of fun, flexibility, and body positivity, (for people of all sizes, fitness levels, and abilities) check out the Fit Fatties Virtual Event Challenge! This is something that is a constant struggle for me- the way people intertwine fitness, dieting, and weight loss and see them all as one and the same. It’s a constant frustration that most places with a fitness focus can get overtaken by messages of weight loss and calories, and of course the assumptions that everyone is interested in fitness to lose weight. This is pretty much the main inspiration I had for creating my blog. It shouldn’t be asking too much to want to talk about lifting heavy things with other folks who enjoy it without being given unsolicited weight loss advice and asked why I even bother if I’m not trying to lose weight. It seriously disturbs and disgusts me that there seems to be so much of this going on. That just goes to show you that those people are clearly in it for the wrong reasons. People like that make it extremely difficult for others to stay positive and actually make true progress, no matter what the goal is. I read an article recently that listed cardio exercises that are “a waste of time” and it seemed the reason was because they weren’t as effective fat-burners as other exercises. Cardio is supposed to be good for your heart though! I dance and do a lot of yoga. It feels good to move and stretch. It’s fun and helps clear my mind. Losing weight is not my goal. To say any exercise that doesn’t burn the most fat is a waste of time reflects a very narrow view. I completely agree. In the world of fitness and nutrition, everyone has an opinion nowadays, and all of those opinions are not necessarily geared toward the general public, and I think it is crucial that people realize it all depends on your goals! We should not be focusing on negative emotions toward those who are actually getting up and getting moving, because there are so many who are not doing this. Well, no. Where on earth does someone get an idea like that? At that rate, all you’re accepting is reality, and honestly, barely even a minor chunk of that. This was another person who confuses “acceptance” with “liking” or “approving”. And I don’t really care who likes or approves of my weight, or any other aspect of me. I don’t need that kind of “acceptance”. The only acceptance I’m looking for from the vast majority of people is their ability to mind their own business and keep their criticism (and in some cases, their approval) to themselves. People have so confused movement and body size that they cannot tell there’s a difference. I know that until I found FA and did a lot of deliberate rewiring of my brain circuits I made those same assumptions, including about myself. To this day there are times when I catch myself thinking the way most people do about fitness and body size. When that happens, I sit down and picture Olympic athletes I’ve seen over the years. I remind myself that those tiny, lithe gymnasts are not fitter than the largest weight lifters and wrestlers. They just have a very different physique better adapted to a different sport. Marathon runners and discus throwers may look quite different at the top tier of their sports, but they are equally dedicated to their work and have a similar fitness level. And then I think about all the fat runners, dancers, swimmers, etc. I’ve known personally. But most people have never parsed the most common social messages about fitness at all. They got their views from commercials for diet plans and gyms that make all their money from the fear of fat which they promote and sell and make far worse. Most people are caught in society’s feedback loop about body size vs health and moral worthiness. Until we can change the dominant message, most people will continue to engage in this casual prejudice. My horrible experiences in PE class during my childhood are why I am almost 100% sedentary. Maybe some different treatment from different people in my youth and I’d be different, but no telling now. Don’t allow someone from the past to rob your future! Your life is worth more! This comment kind of skeeves me out. Could we apply the Underpants rule here? Have you ever participated in a Dance Marathon? Do they even do those anymore? I’m perhaps channeling a favorite episode of Golden Girls. I am afraid to go to the gym because I’m so convinced I’m going to get triggered all over the place. I don’t want anyone assuming that I’m exercising to lose weight, or that my focus is burning calories, or suggesting that I get weighed/measured to “show my progress.” NO. I can’t handle any of that. I have been struggling with this in regards to finding yoga communities. I have been doing yoga lately and I love it! But so much of the yoga culture is so freaking rife with judgement and fat hate. There is progress out there that you can measure in ways other than pounds guys! Really. Like in March you tried to do this pose and you could barely hold it for a few seconds, now in December you can not only hold it for a long time, but your back is straighter! See, progress – getting better at doing the thing. Isn’t that worth celebrating when it doesn’t make you thinner? I am doing yoga to be stronger and more flexible, and because I enjoy it. It has nothing to do with fatness. People really cannot seem to wrap their minds around that concept. Does anybody have any good goals to meet that AREN’T about weight and inches? I want to improve my energy levels, and I already hate exercising. The Internet says that having small fitness goals helps, but all their fitness goals are about losing weight, or running. I don’t run, and I don’t care to lose weight (if I could, which would be doubtful). Any thoughts for people who have been there before? How about tracking what you actually do at a sport? We had the example of yoga poses already. In weight training it could be to increase the weights. In cardio it would be to exercise longer or improve your time for a set of exercises. Its always ‘I want to be able to do X’, not ‘I want change X about me’. I used to hate exercise (PE at school did ‘great’ work there). I startet liking it by starting weight training, which I had never done before, so it wasn’t tainted by memories. Plus, at weight training, you’ve got a chart stating clearly how much you could lift every time. You get ‘hard’ numbers for your progress. how about a pedometer and simply see the number of steps you take per day. set gentle goals involving the number of steps you take. maybe? Do it for X minutes a day until it’s easy (that is, you don’t break a sweat or experience accelerated heart rate or feel the burn or whatever), then add a few more minutes, and then when that’s easy do a few more minutes. When you’ve hit the limit of your available exercise time, try increasing intensity slightly, or using bigger weights, or doing something new for X minutes.